Is The Thunder Logo Really That Bad? It is now officially the silly season when it comes to the NBA. No more to write about the draft or free agents and training camps haven't started so writers are reduced to writing stupid stories about stupid subjects. Zach Lowe, who is a highly respected writer and has done some great stuff, has now written a piece for the ESPN website Grantland ranking the logos of all 30 NBA teams. Seriously. Perhaps you've even seen it by now. He admits the rankings are pretty subjective and based largely on his own opinions. He puts the Thunder's logo dead last. I've never really thought is was GREAT, but I've also never thought it was horribly pathetic either, especially when you compare it to the others out there. Straddling the fence resulted in this vanilla mishmash. “It might be the best D-League logo ever made,” says Tom O’Grady, who served as the NBA’s first creative director before leaving to found Gameplan Creative, a Chicago-based branding consultancy. Team officials say the shield hints at a leader charging into battle, and that the upward rising “bolts,” which don’t look like bolts at all, symbolize a young franchise growing up. No team has worse art, top to bottom, and Nike will push for an overhaul once it replaces Adidas as the league’s apparel partner in 2017. Nike and the Thunder are already talking, and the Thunder “haven’t ruled out” a more explicit weather-related secondary mark, Byrnes says. Well turns out there is a little news here, that bit about Nike pushing for big changes and Brian Byrnes admitting something could be in the works. But back to the logo. At least there's quite a bit more there than is featured in many of the others around the NBA. Lowe ranks the Pistons logo a couple of spots above OKC's and all it is is a basketball (and a red one at that) with the words "Detroit" and "Pistons" on it. That's better than the Thunder's? And how about the Nets? They come in at Number 17. It features a shield too and the word "Nets" inside the shield. There's also a basketball featuring a letter "B" and the artwork is black and white which Lowe calls "groundbreaking." I remember when using color was groundbreaking. And then there's the Lakers who come in right in the middle at number 15. 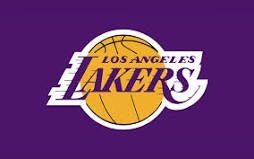 Their logo is a basketball featuring the words "Los Angeles Lakers" the words are slanted a little but still, that's it. To me if you're gonna rank these things the ones at the bottom ought to be the logos that feature nothing more than a basketball and the team name. How much work goes into that? The Number One ranked logo is the Chicago Bulls. It features the words "Chicago" and "Bulls" and then that nifty cool face of what appears to be a really angry bull. I admit that one is really good, not my personal favorite but really good. I'd probably put the Celtics Number One mostly because of the leprechaun. I'd probably put the Thunder's right about where the Lakers' logo is, in the middle. Lots of color, more than just the team name and a basketball, looks fine on a golf shirt. Not totally crazy about how it looks at center court though. I'd probably just go with the shield and leave off "Thunder." Makes you wonder what could be in store for the future with Nike coming on board. Maybe the Thunder will wear something different every game like the Oregon Ducks or the Oklahoma State Cowboys. Oregon's main logo by the way is just an "O". Oklahoma, also a Nike school, goes a step further with an interlocking "O" and "U". Oklahoma State of course really does it up big with a stylized brand featuring an "O" an "S" and a "U". And so after criticizing these types of stories as being stupid here I've gone and written almost a thousand words on the subject. Training camp can't get here soon enough.